It looks like a very lovely pen and would look great in my collection. Here’s hoping I win. It is a lovely pen Michele. Good luck! what an intriguing pen! please enter me in the contest – thanks! You bet teabird! Good luck! I think so too Ratika! Good luck! Fingers crossed. 😀 Thanks for the giveaway! You’re welcome zzdia! And good luck! I would enjoy trying it out! Thanks for commenting Priya! And good luck! Would like to win! 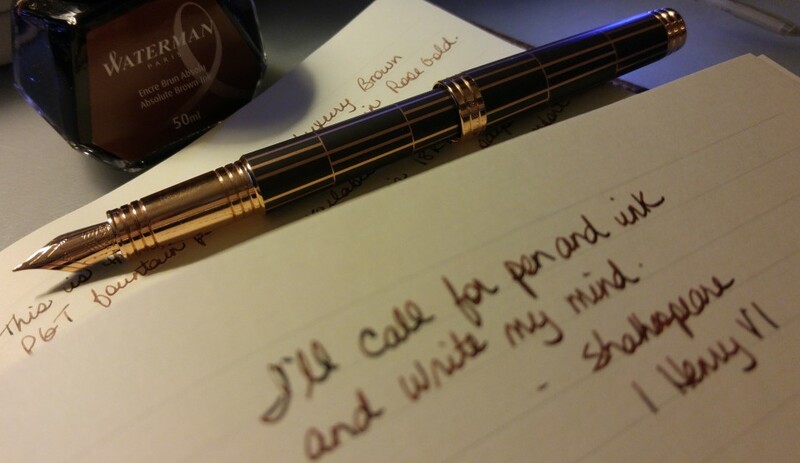 I have never written with a fancy pen of any kind before. Good luck in the giveaway Mama Muse Me! Wow, another giveaway so soon 🙂 It looks like a neat pen, I do actually prefer slim ink pens; I find them easier to write with. Well then you will like this one Maemi! Good luck! Looks pretty. Thanks for the chance to win. You’re welcome Sharon! And good luck! Rita, you can call it anything you like! Thanks for commenting and good luck in the giveaway! It’s so pretty-I hope I win-thanks for the giveaway! You are welcome Missy! Good luck! Agreed Jonathan! Good luck in the giveaway! Woah! I would love to win this pen! Best of luck in the giveaway Roshan! Ooh. I don’t mind a slender section! Thanks for mentioning this draw in your entry for the 24th– I guess I didn’t start following until after this went up, and it would be vexing to see the winner announced without having known there was a contest. And since I haven’t commented before, I’ll also take a moment to admire the Parker you use in the headline. Ooh, again. Dirck I’m so glad you saw the giveaway! Best of luck. Don’t forget to comment on that post to enter. And thanks for the Ooh on the Parker – I agree! For some reason I thought you were commenting on my Journal Writing Wednesday post instead of this one – oops! Best of luck in the giveaway. You are welcome Ajhna, and good luck in the giveaway! Yes it is difficult to find the perfect planner inserts. Good luck with that too! That is a beautiful pen- I love the silver! Yes the silver is what attracted me to it too! Good luck! It has beautiful lines. On the pen, not necessarily from the pen.